Each year, Inc. magazine ranks the 500 highest-growth private companies in the country. The magazine actually expanded the popular list to 5,000 this year, but we'll just focus on the crème de la crème. 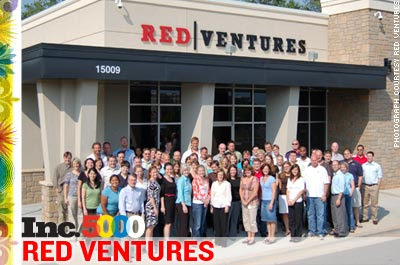 Four local companies made the top 500 and they are: Red Ventures (Charlotte) at No. 17, FireFold (Concord) at No. 73, nGroup (Fort Mill, S.C.) at No. 246, and Red F (Charlotte) at No. 476. Red Ventures is a marketing firm that solicits new customers for national companies such as DirectTV, Sirius satellite radio, and ADT security systems. The company’s revenue grew to more than $103 million in 2006 from $1.7 million in 2003. If salaries are increasing at Red Ventures as quickly as revenue (more than 5,000 percent in three years), sign me up. FireFold specializes in retail sales of audio and video cables and other accessories for high-definition television. Its revenue grew to $6 million in 2006 from $200,000 in 2003.
nGroup is a human resources firm that supplies temporary workers to manufacturing and distribution operations. Its clients include The Home Depot Inc. and Target Corp, and revenue grew to $6 million in 2006 from $510,000 in 2003. Red F, a marketing firm, focuses on nontraditional marketing methods for clients that include Wachovia Corp. and DirectTV. It increased its revenue to $12.8 million in 2006 from $1.7 million in 2003. Thirty-four other area companies made the top 5,000. Inc. has published the full list in its September issue, and it's also available at www.inc.com.